Product Description: All-natural hair dressing moisturizes hair and imparts a shine and bounce to curls. Nutrient rich vegetable butters condition hair, restoring moisture, body and shine. Enhances curls, minimizes frizz and provides curl control. For thick, curly hair. Adds moisture, definition, and shine. Ingredients: De-ionized water, Butyrospermum Parkii (Shea butter)*, Macadamia Ternifolia seed oil, Mangifera Indica (mango) seed butter*, Persea Gratissima (avocado) oil, Cocos Nucifera (coconut) oil*, Aloe Barbadensis leaf extract, silk protein, Melia Azadirachta (Neem) seed oil, Daucus Carota Sativa (carrot) seed oil, Caprylyl glycol, Sorbitol Esters, essential oil blend, Lonicera Caprifolium (honeysuckle) flower and Lonicera Japonica (Japanese honeysuckle) flower extract and Tocopherol (vitamin E). * these ingredients are certified organic. 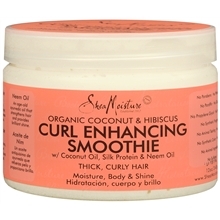 My Take: This product is the first I've used from Shea Moisture and I was truly impressed by the results we achieved using the Curl Enhancing Smoothie! I used it immediately after washing and conditioning my 3b hair, as a leave in conditioner and detangler. My curls were nicely defined and my hair was soft, shiny, and beautifully fragrant. It resisted humidity induced frizz and though I used no other product after applying the Shea Moisture Curl Enhancing Smoothie, my 2nd day hair is gorgeous as well! We also used the product on Lo's 4a/b hair and had great results with her as well. In fact, my husband refuses to use anything else in her hair! We are definitely fans and will continue to use this product and look forward to trying more items within the Shea Moisture brand. I'm a 4a curly, and I LOVE shea moisture! Their products are such a great value for the quality of the ingredients! There are a lot of products with much larger price tags that are full of fillers and alcohols. I've recommended them to everyone that I know, natural or not.